Yes, we are still giving up meat for Lent, but by technicality fasting is not required on Sundays. Besides, we were just really tired of eating hummus or guacamole for every meal! 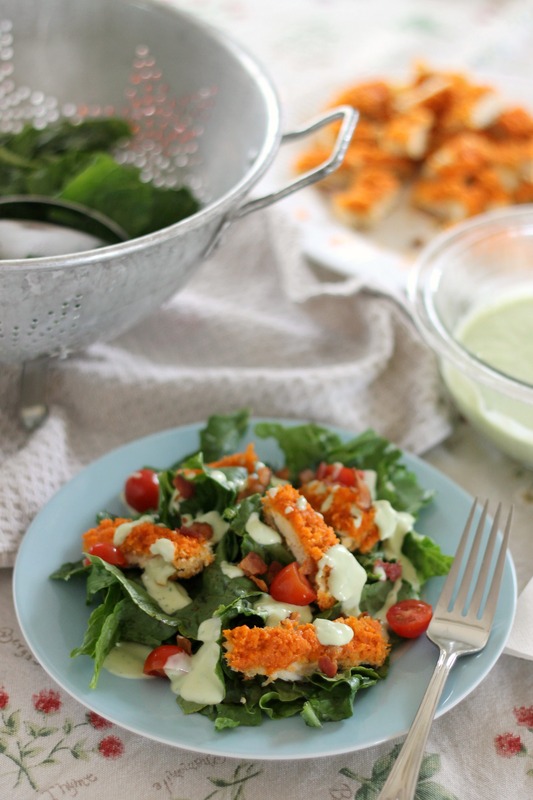 We took advantage of this opportunity and made what caught both of our eyes this week- a salad topped with buffalo chicken and homemade avocado ranch sauce. There really are no words for how absolutely delicious this is! Our whole family loved it (well, minus the two picky ones who eat absolutely nothing but cereal,hot chocolate, and peanut butter and jelly sandwiches a large percentage of the time), and we are looking forward to making this again soon. The flavors are fresh, the chicken is perfectly spicy, and the avocado ranch sauce adds a bright and creamy element to help tone down the spiciness. We made some bacon crumbles to top our salad, but blue cheese or cheddar cheese would also be nice instead of or in addition to the bacon. Be warned: the chicken on the top is addictive. Surprisingly, it is relatively healthy too because it is baked, not fried. We love Buffalo chicken dip (not so much the wings), and this chicken really put us in the mood for some of that dip. Maybe this Sunday! To make the chicken, preheat the oven to 475˚ F. In a large skillet, toss the panko with the oil. Toast over medium-high heat, stirring occasionally, until golden brown, about 8-10 minutes. Transfer the toasted crumbs to a plate or a shallow dish. Cover a baking sheet in foil and coat with cooking spray. Working in batches, dredge a few pieces of the chicken in the flour, then the egg white mixture, and finally the breadcrumbs, shaking off the excess between each step. Lay the coated pieces on the prepared baking sheet and repeat with the remaining chicken. Spray the tops of the chicken pieces lightly with the cooking spray. Bake until the chicken is cooked through (check to see that it registers 165˚ F with an instant read thermometer) and lightly golden brown, 10-12 minutes. While the chicken cooks, melt the butter in the wing sauce in a small sauce pan; whisk the butter into the sauce to combine. To make the dressing, place all of the ingredients with 1/4 cup of buttermilk in a blender or food processor and blend for 10 seconds. Check consistency and blend in additional buttermilk if necessary. Scrape down the sides of the blender and blend until the avocado is completely pureed. When the chicken is finished baking, brush each piece with the wing sauce. If you want it to be more spicy, brush both sides. 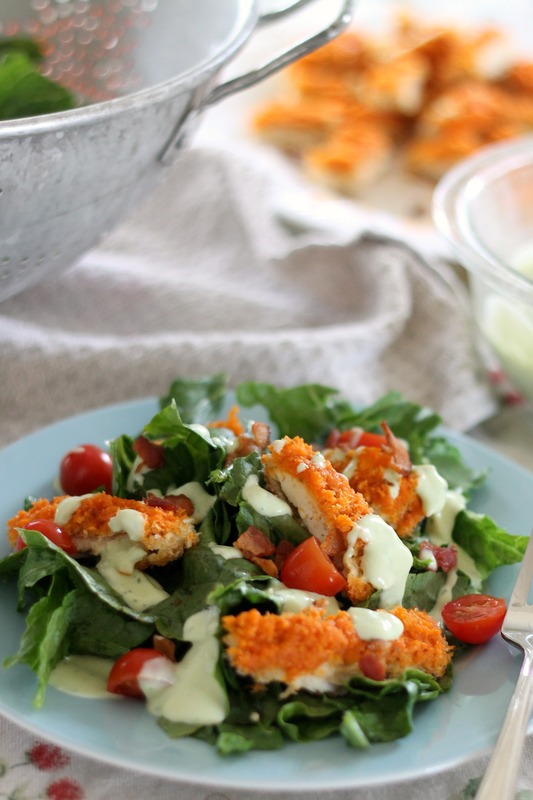 Cut the buffalo chicken into strips and lay on top of a plate of lettuce. Add your desired toppings and spoon the dressing on top. Serve with the chicken is still warm. Enjoy!